With the emergence of next-generation Digital Mobile Radio (DMR) standards, customers can now deploy feature-rich, reliable communications systems more economically than ever. Our MOTOTRBO Professional Digital Two-Way Radio System combined with the AVTEC Scout console system offers a fully Integrated solution for commercial environments. 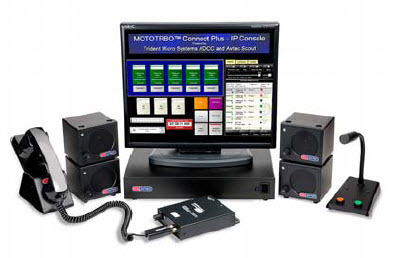 AVTEC’s Scout pure Voice over Internet Protocol (VoIP) dispatch console system uses a direct IP interface to connect with conventional (IP Site Connect), or multi-site trunked (Connect Plus and Linked Capacity Plus) MOTOTRBO systems. Wire-line connections provide a direct IP interface between the console system and the radio infrastructure, which avoids system radio frequency (RF) loading associated with wireless connections. Another key advantage of wire-line is support for business-critical connection redundancy as well as scalability to hundreds of talk groups, all with a simple Ethernet connection. For mroe information on this product, please visit the AVTEC website.